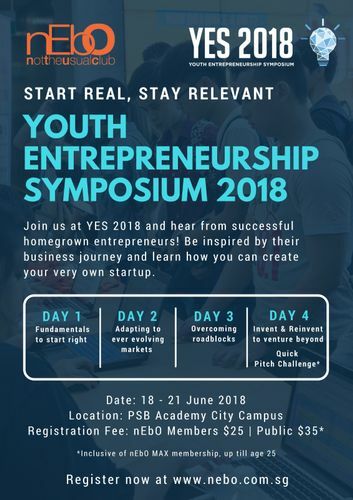 YES is a 4-day event for youths aged 17 to 25 to find out more about entrepreneurship through interactive keynotes, workshops and dialogues. Participants will be able to learn from seasoned entrepreneurs on how they grew their business from zero to hero, and network with them! The theme for our 11th edition this year is "Start Real, Stay Relevant", where participants will be exploring the essentials of starting up and staying relevant in an uncertain market.